He couldn’t remember. He couldn’t remember it. It’s not that he had forgotten, not that the memory had slipped away like so many do these days. You know, some of us better than other just how tricky or slippery our memories can be. But it just, it wasn’t there; it hadn’t been and couldn’t be, because he Thomas, just about all the other disciples wasn’t there. He hadn’t actually seen the nails tear into Jesus’ flesh, he hadn’t seen the cords of rope wear and burn through Jesus’ skin. He hadn’t seen him that first time when the risen Jesus showed up to the disciples. We’ve always heard, we’ve always read and been told that Thomas was the doubter, the one who needed to see to believe, but it doesn’t have to be that way, what if he needed to see, not to believe, but to remember. Perhaps he wanted to fill the holes in the story with his touch, perhaps he just needed something solid to save him from his guilt at abandoning Jesus. There is no shame in wanting more than just listening to others talk about Jesus. There is nothing bad about wanting to experience, to remember, to have a memory of your own. For it is true that our memories shape us. In so many ways. Steve jobs could say this because in 2003 he was diagnosed with pancreatic cancer, and he died about 8 years later in October of 2011. Remembering, like this isn’t just the ability recall facts, details, names and numbers. this isn’t a mere intellectual exercise, but to have an experience, a tangible, touchable, memorable thing, a remembering that impacts how we live, changes how we see the world, the people around us. Not that they want proof. No they aren’t looking for someone to discover Noah’s ark, or Indiana Jones to recover the ark of the covenant. But also not to just be told, to sit and listen to someone talk about Jesus, to even sing about Jesus, no matter how fancy or hip, isn’t going to cut it. They are not looking to see Jesus on screen or stage, but to touch him and to be touched by his body even today. To be able to remember the touch of love that is so real it rips a hole in our heart. Isn’t that what we say here every week. Do this in remembrance of me. This kind of remembering isn’t just the mark it on the calendar, acknowledge it happened along time ago in a far away place. No this remembering is different. This is the kind of remembering that allows you to see the wounds, the scars of others. This is the remembering that allows us to look even at our own selves at those places that are rough and ugly, at the pains. The remembering that we do here together is a healing that goes beyond any medicine or therapies. This is where we remember into today what peace looks like, the peace that overcomes fear. That is the peace that will hold the hand of a stranger, hold the hand of someone who doesn’t look, think, speak, act, even smell like you do. But to simply be touched and to touch in love. In this remembering we actually heal the dismembering that happens so much in life. We don’t have to pretend we’re perfect here, that we have it all together here. Like those disciples in our gospel this morning we’ve all got those things we like to lock up and hide, for fear they may get out. But the risen Jesus comes to us every week and says, just as he did for Thomas that day and says, “Touch, feel, my body given for you. Now go out and give yours away too, take what I have given you forgiveness, mercy, welcome, and peace and share that with everyone. That is what is most important, that is a memory worth touching, that is a memory worth keeping, that is re-membering. I like Thomas. I like Caravaggio’s image of Jesus and Thomas. 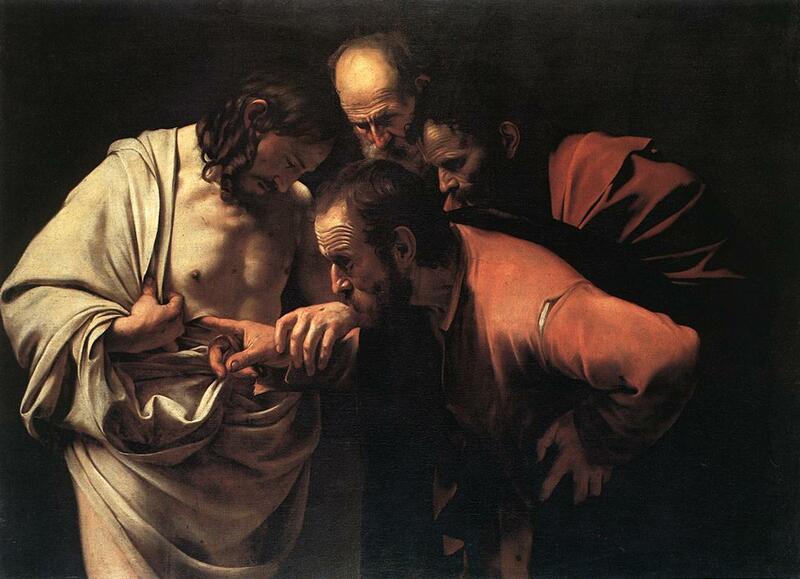 To me it seems like Jesus is grabbing and guiding, pulling a hesitant Thomas into his wounded side. This isn’t an antiseptic and polite interaction. Touch makes things real; love isn’t real until it is touched and felt, skin to skin, my lips on my childrens’ cheeks and forehead, my husband’s arms around me, the tears of the grieving and troubled on my shoulder. This isn’t shameful; this is living through death. This is sacred.